Member Profile: Ithaca Farm Making a Difference On and Off the Table with Green Fork NY! Ithaca Farm Making a Difference On and Off the Table with Green Fork NY! When local organic farmer Anton Burkett started a CSA (Community Supported Agriculture) farm nearly 20 years ago, little did he know that the concept would grow to inspire not only a recipe box solution sourced from the Finger Lakes region, but also make a difference in the lives of individuals who needed it most. But, before we get into that, let’s start with the first course (a little background)! For those unfamiliar, a CSA farm allows city residents to have direct access to high quality, fresh produce grown by local farmers. When you become a member of a CSA, you’re purchasing a “share” of vegetables from a regional farmer. Burkett loved this idea of incorporating community into his farm, and started his CSA nearly 20 years ago on his Early Morning Farm location. And he wasn’t the only one who was hooked, to-date Burkett’s original CSA has over 1,500 members that subscribe to weekly deliveries. With over 50 pick up sites last year in regions including the Syracuse, Ithaca and Binghamton, the demand for fresh local food was apparent. The only issue? Customers would receive random vegetables, but didn’t know what to do with it. The solution? Burkett and his business partner Tracy McEvilly decide to start a recipe blog for the farm to help their customers come up with delicious ideas. McEvilly actually developed over 1,000 recipes for the original blog! That was four years ago and since then, the concept has evolved. Fast-forward to today, andGreen Fork NY is its successor taking the concept a step further. Green Fork NY actually allows customers to go online to their website and select which recipes interest them. From there Green Fork handles the grocery shopping, and customers are given a recipe to follow, and a delicious dish results! But beyond supplying customers with delicious meals, Burkett and McEvilly wanted to make a difference in their own community. That’s why everything from recipe development, groceries for the meals, to the employees who help put the boxes together, is all local to the Finger Lakes region. And what about the recipe box? Don’t those already exist everywhere? 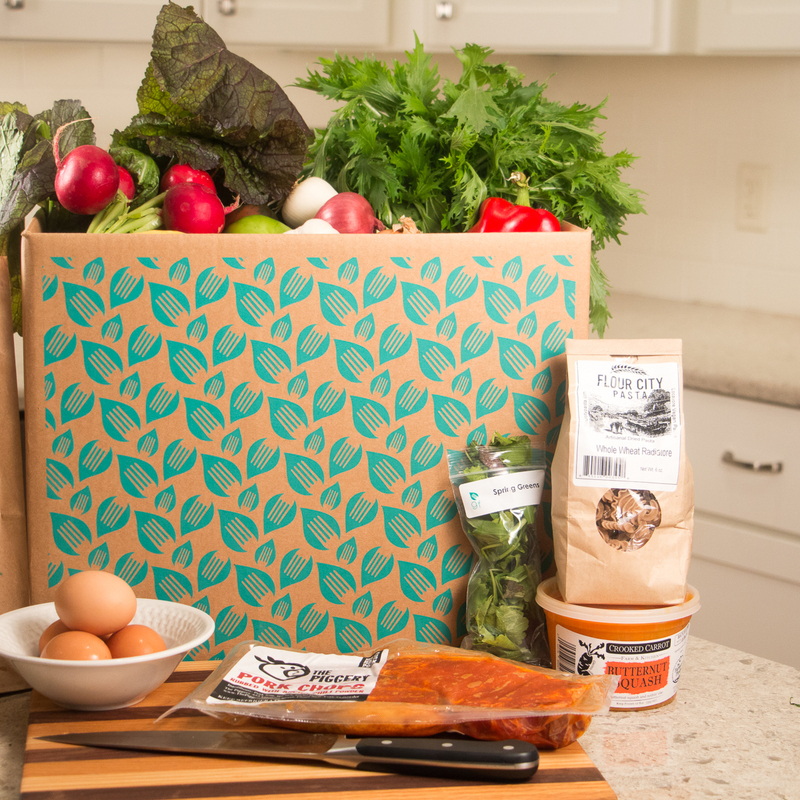 Chances are you’ve heard of the competition: Plated, Blue Apron, HelloFresh and the list goes on and on. So what’s the difference between Green Fork NY, and what makes it so special compared to those other companies? For one, beyond the local aspect,Green Fork NY is not venture capital backed, they do not have a large fulfillment centers, investors, nor do they ship all over the country. Green Fork NY is actually the complete opposite model and prides itself on that. Their goal is to create relationships directly with local farmers and food purveyors in their immediate region. The company also only does a one-day ship vs. every day shipping so everything is as fresh as possible. In addition, 70% of all their ingredients are locally sourced and tailored to the ingredients available to the area they are located in seasonally. Green Fork NY takes Community Supported Agriculture (CSA) to the next level with delicious, seasonal recipes and fresh, regional ingredients delivered to your door. 70% of ingredients are sourced from local farms and producers. Each ingredient box is GMO–free, pasture–raised, regional meat and poultry and delivered overnight in a chilled recipe box to New York state and adjoining areas. For more information, please visit www.greenforkny.com.